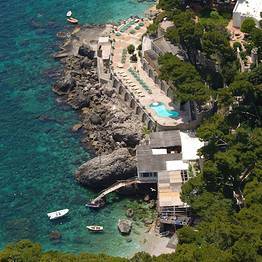 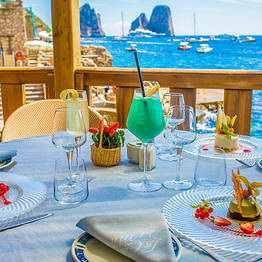 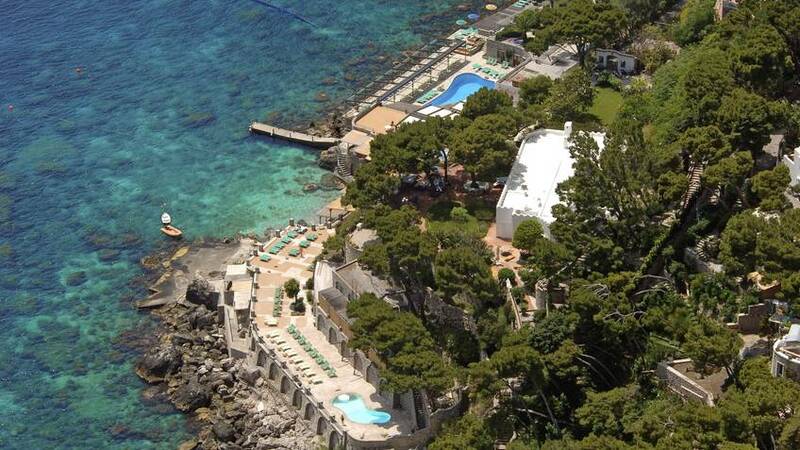 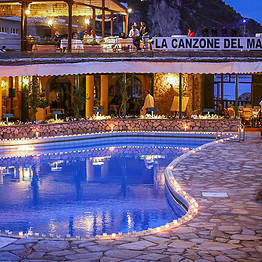 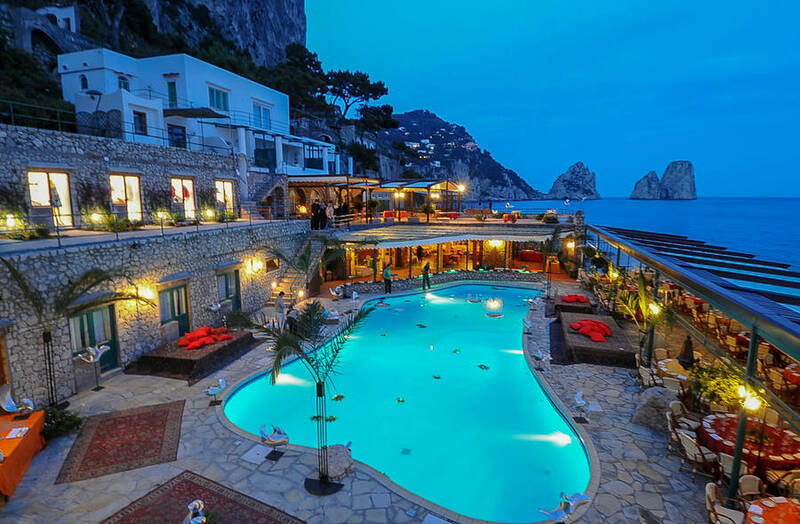 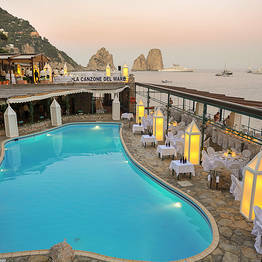 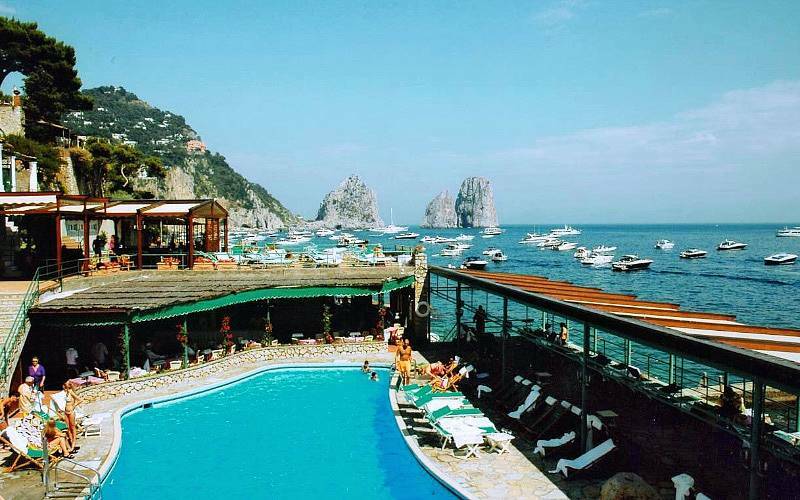 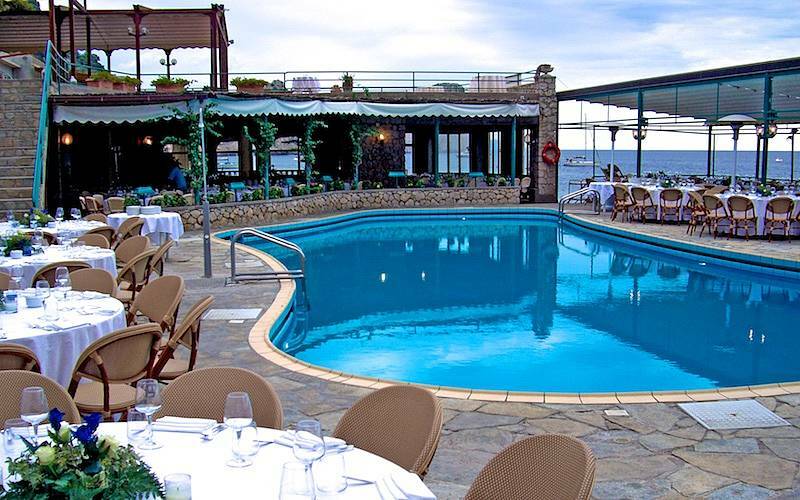 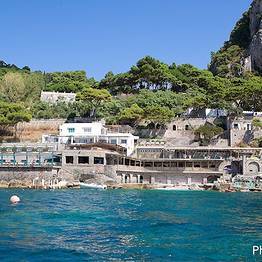 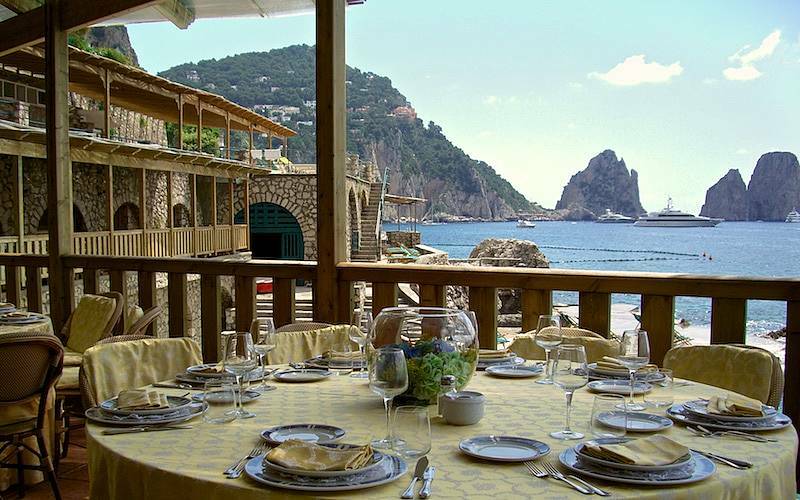 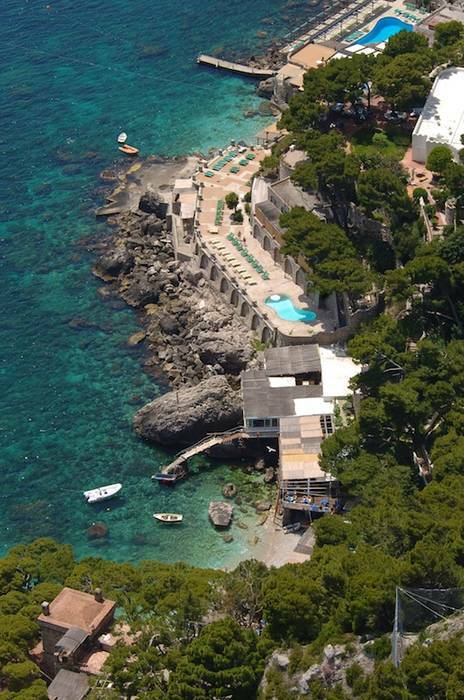 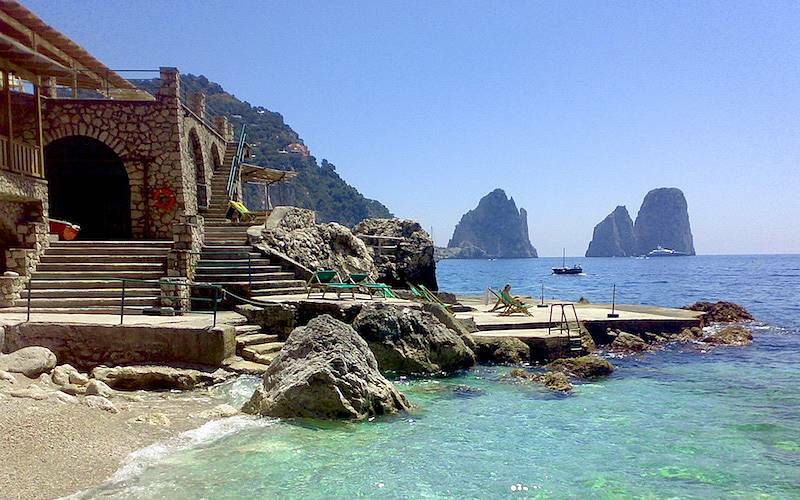 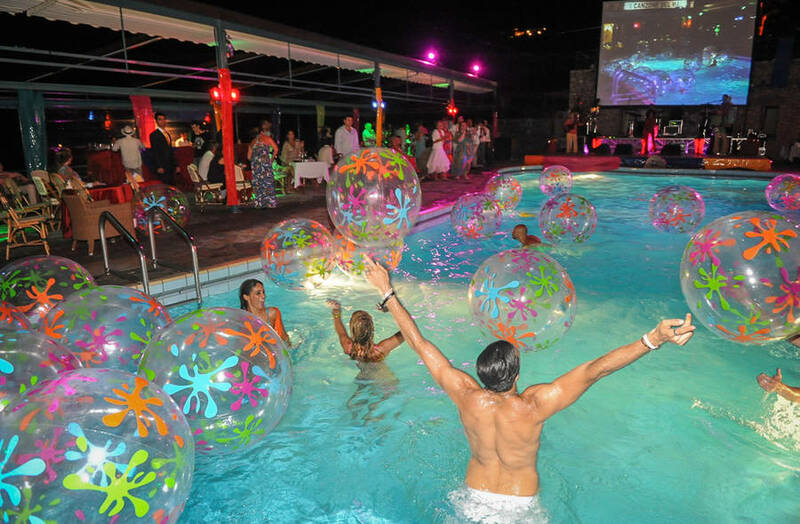 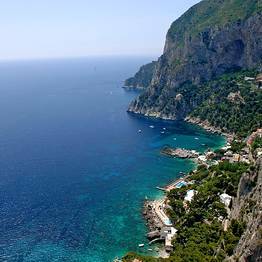 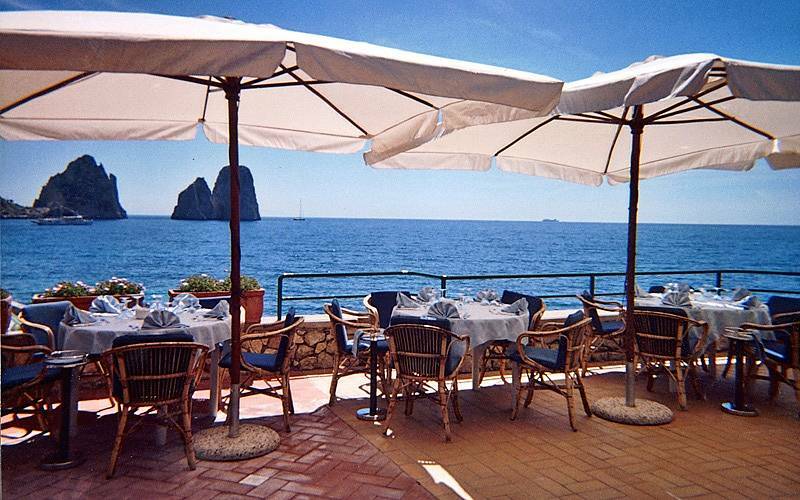 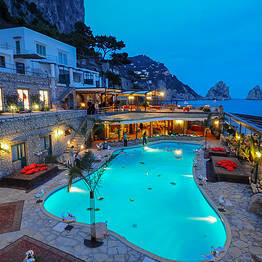 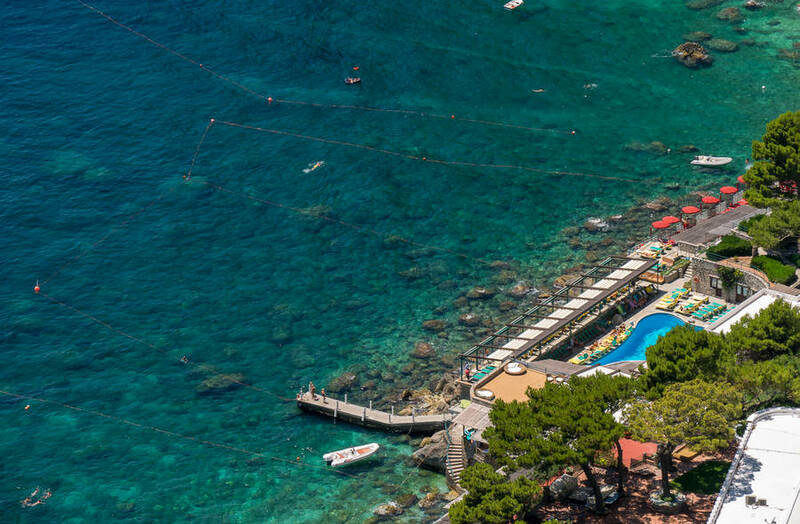 Capri's historic La Canzone del Mare is, arguably, the island's most famous beach club. 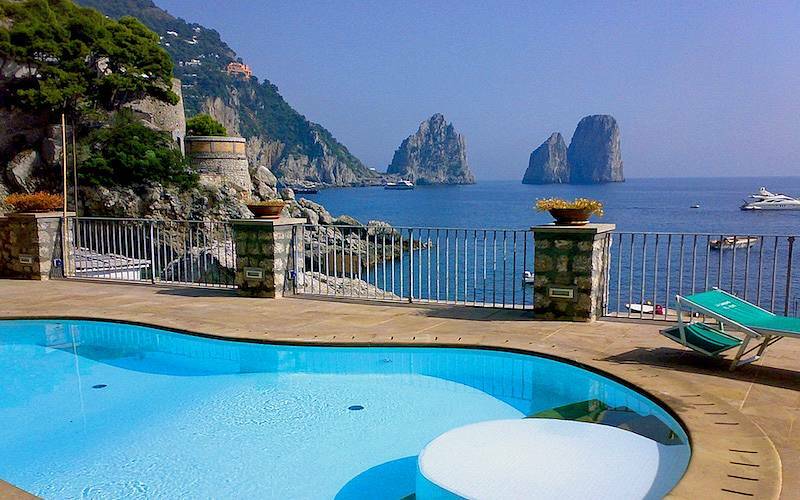 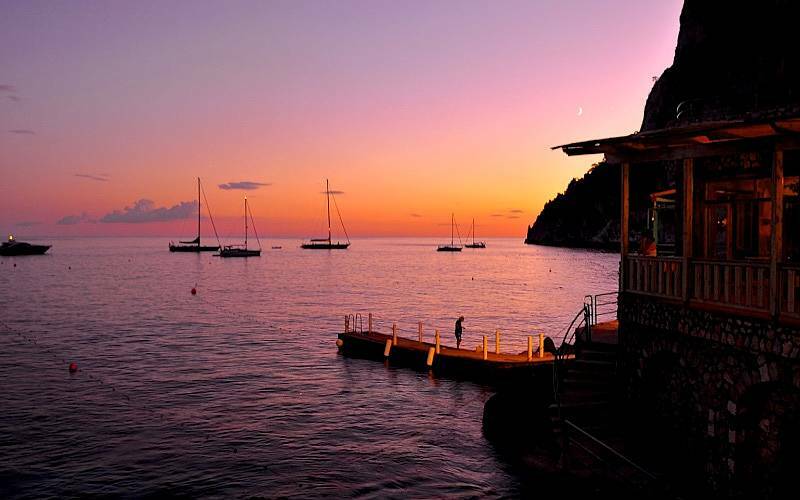 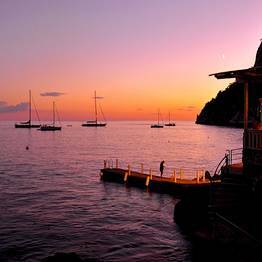 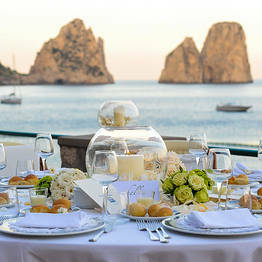 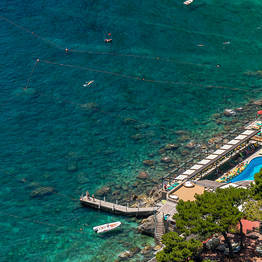 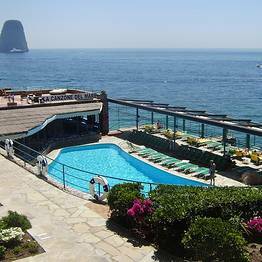 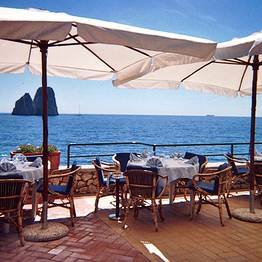 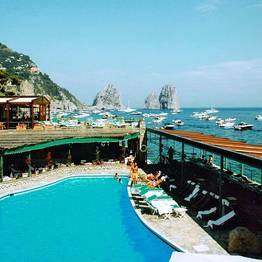 Located in the sunny Bay of Marina Piccola, the lido enjoys unbeatable views of the sea and the Faraglioni rocks. 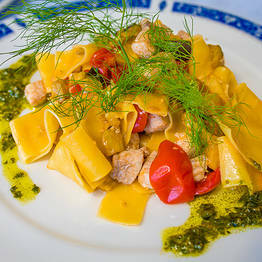 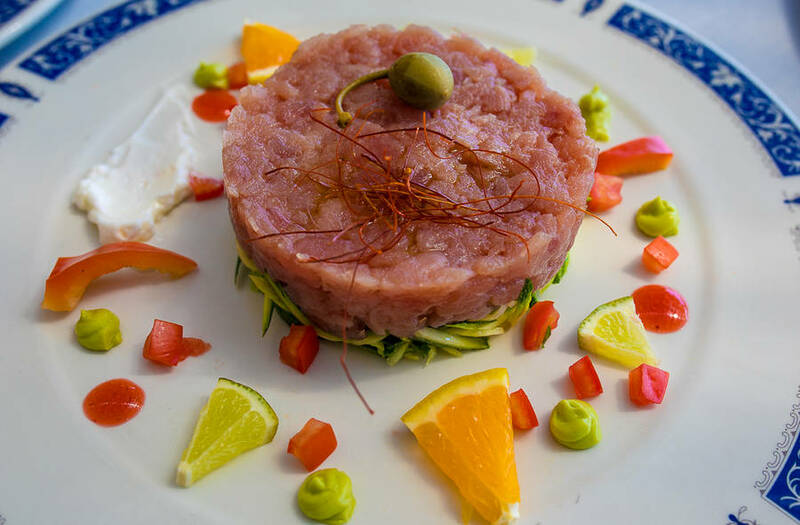 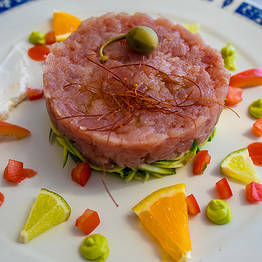 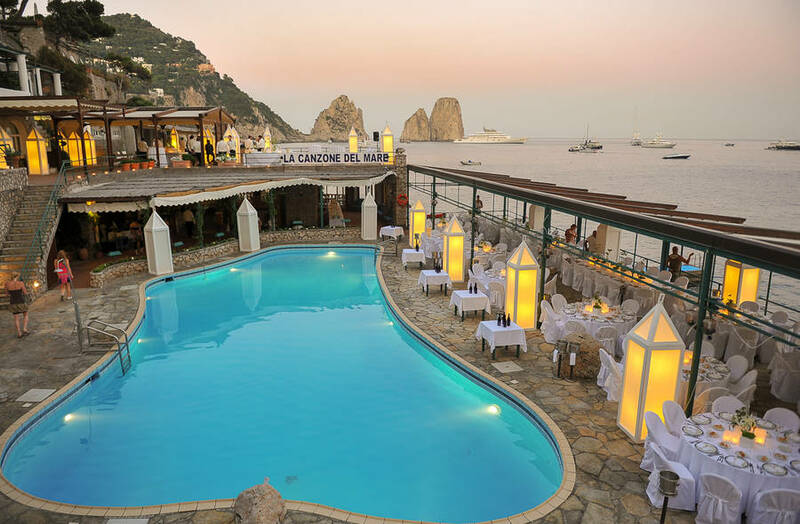 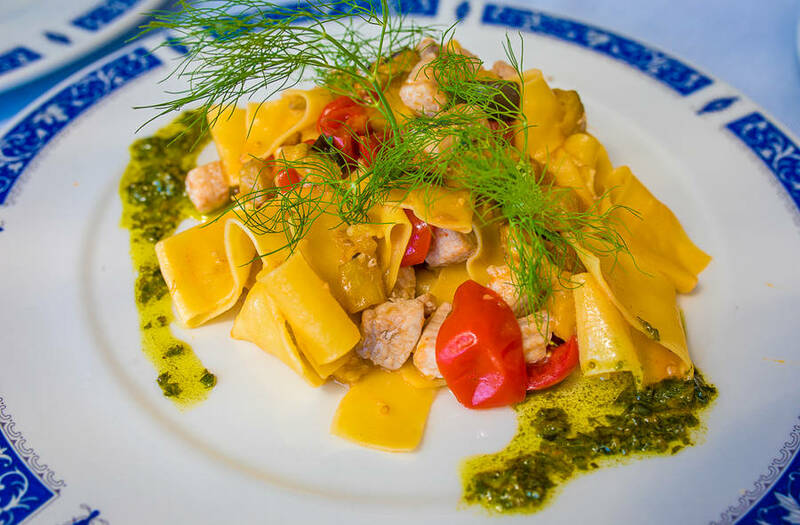 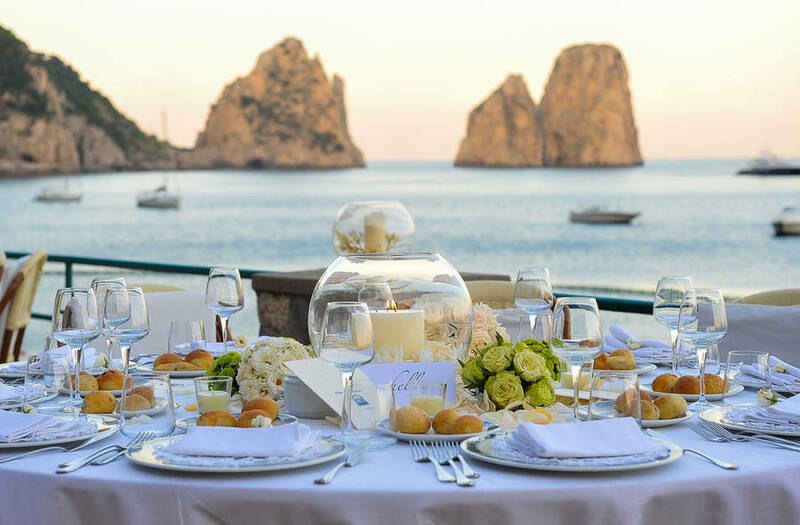 In the past, La Canzone del Mare was the major protagonist of Capri's Dolce Vita and, to this very day, the beach establishment continues to attract a glamorous international clientele. 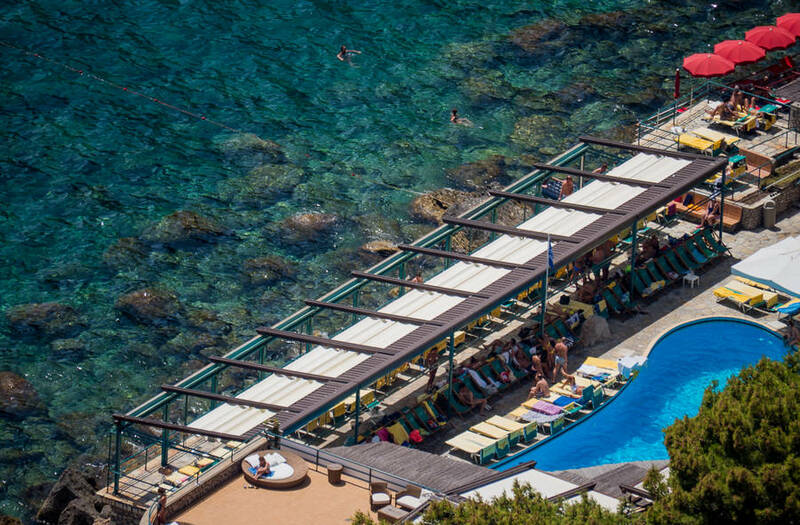 From the terraces of La Canzone del Mare, customers access the main swimming pool, the bar, and the lido's luxurious beach cabins (all with air conditioning, telephone, internet connection and private bathroom). 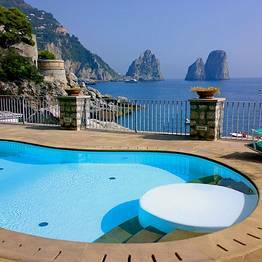 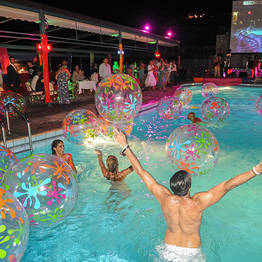 A second swimming pool with massage jets is located in the most secluded part of the property. 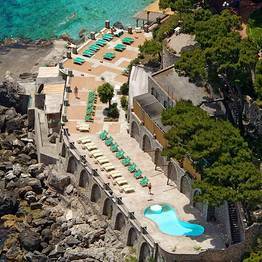 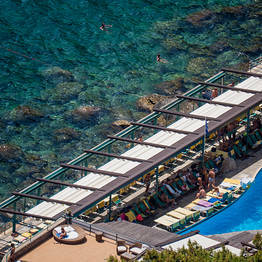 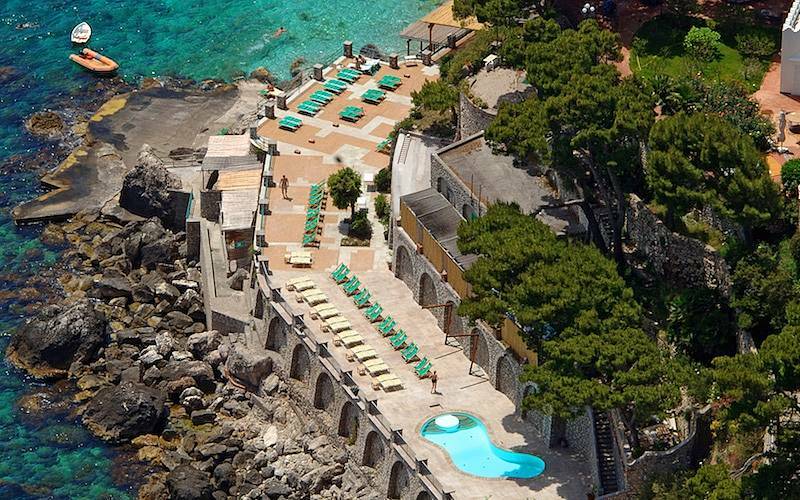 La Canzone del Mare's private white-pebble beach is equipped with sun loungers, beach umbrellas and beach towels. 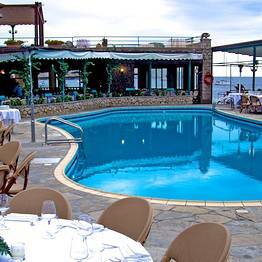 Open daily from the end of April to 1 October. 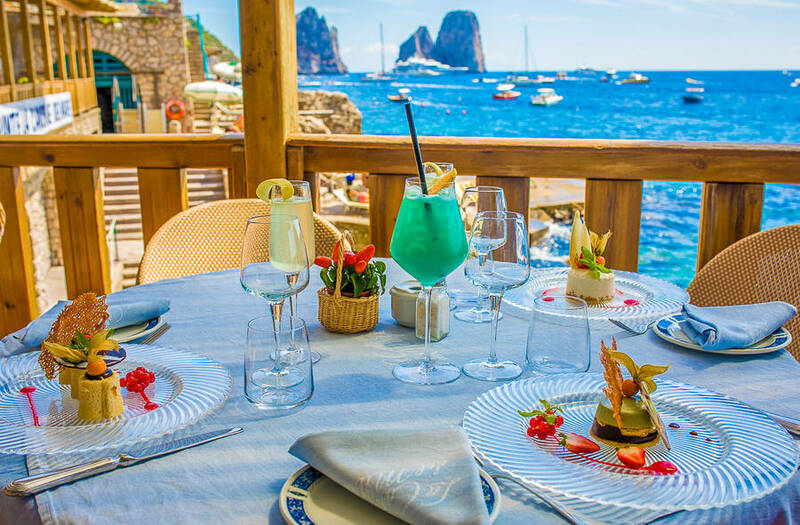 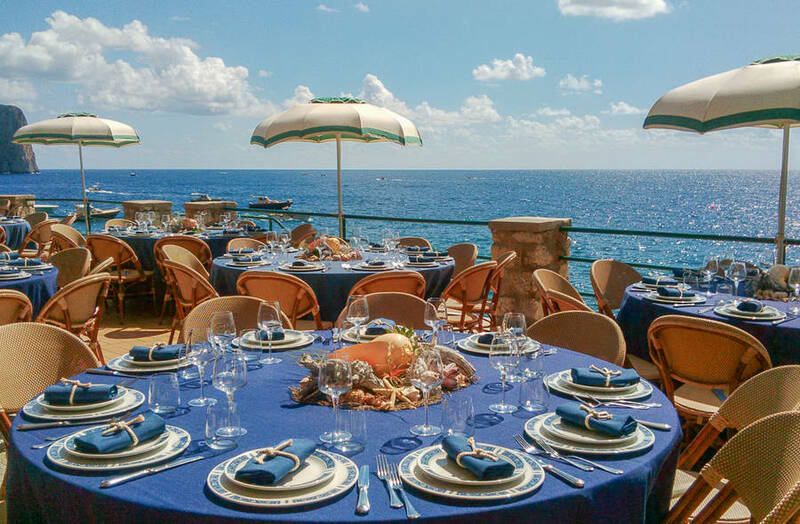 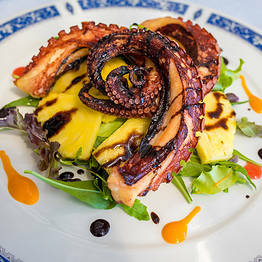 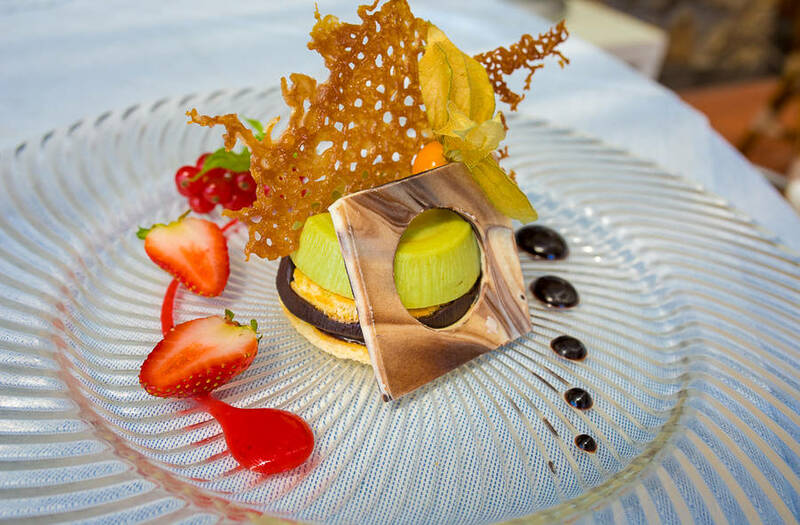 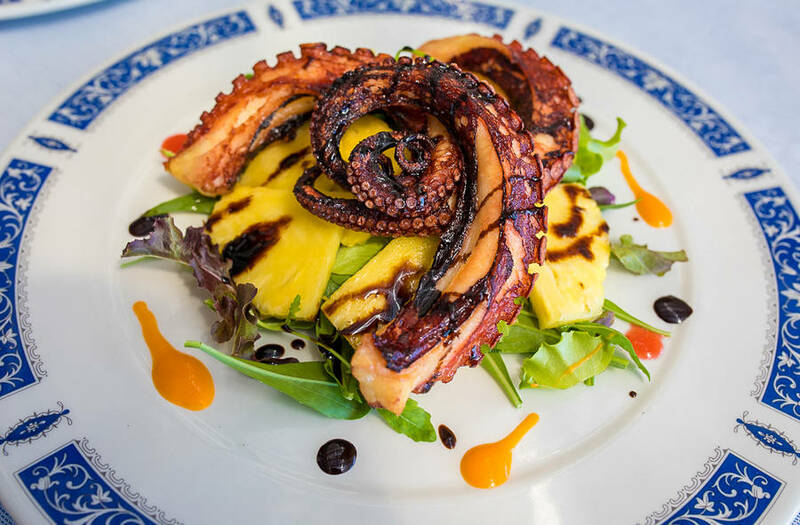 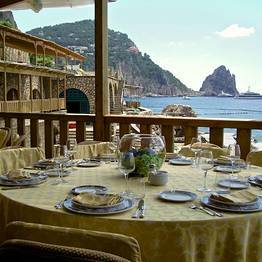 A vast selection of Mediterranean specialties is served in the Canzone del Mare restaurant set directly on the water's edge, including fresh fish and seafood and an ample wine list of regional and Italian labels...all served against an unforgettably scenic backdrop. 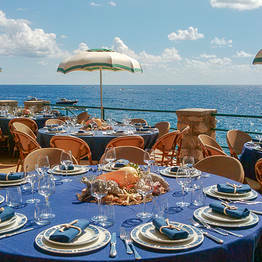 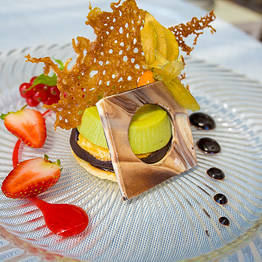 This highly acclaimed eatery which quickly transforms into an enchanting venue for an unforgettable wedding party or gala dinner for up to 700 guests, featuring private tender service for yachts and boats anchored offshore. .
Beautiful, sea view apartments named after some of the world's most loved female style icons, La Canzone del Mare's Diva Suites offer the maximum in comfort and romance. 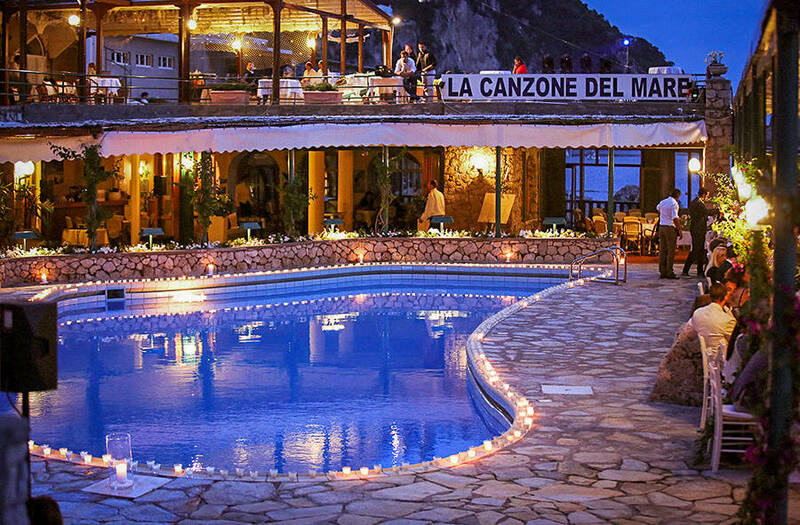 La Canzone del Mare is situated in the Bay of Marina Piccola, from where a fabulous view of the Faraglioni rocks can be seen. 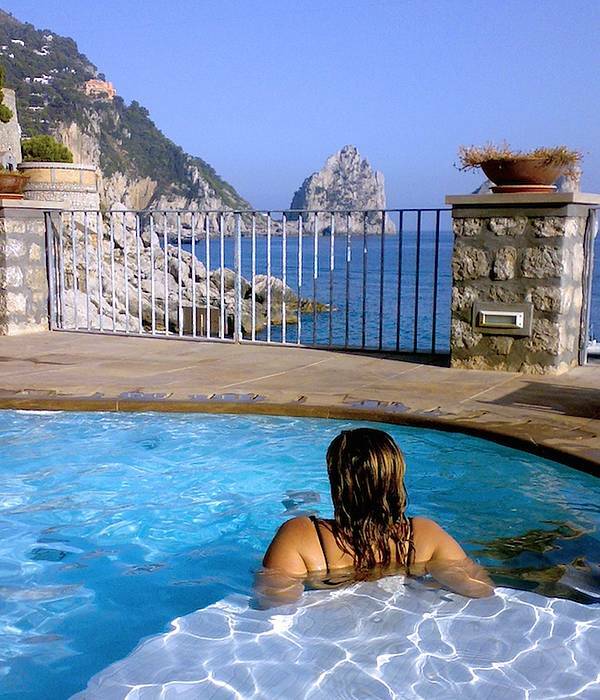 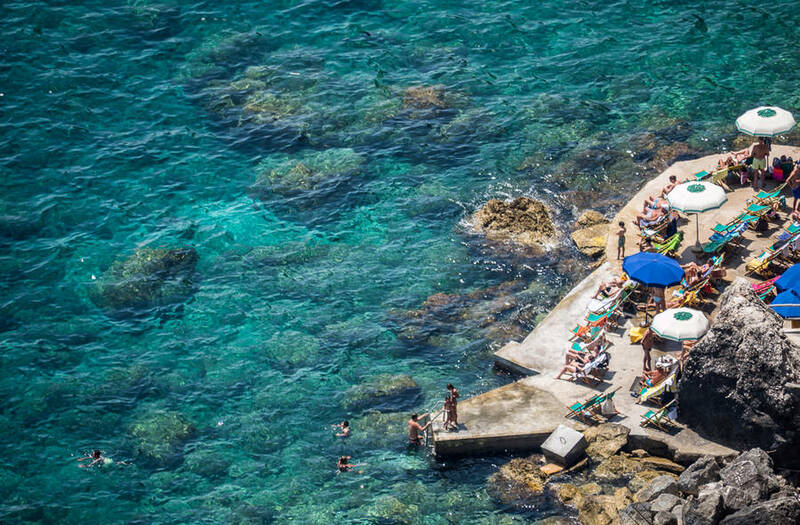 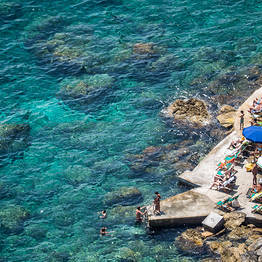 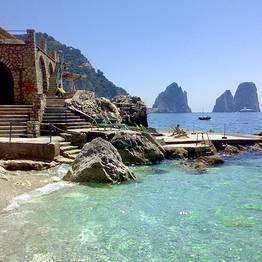 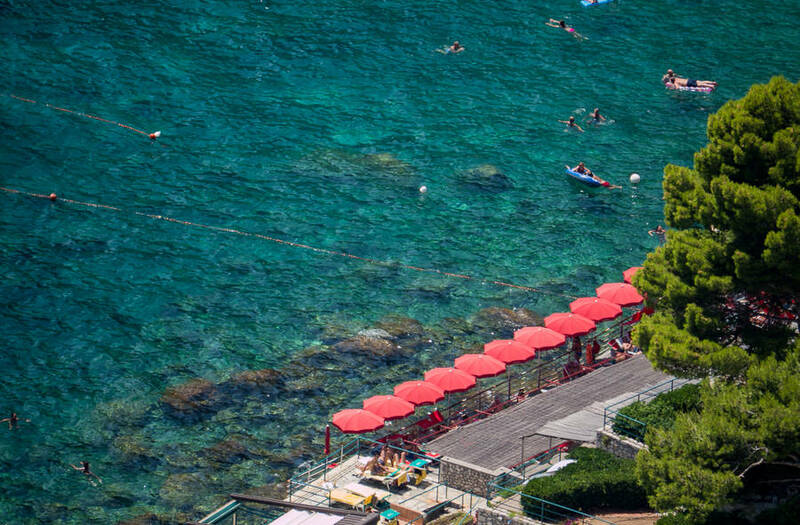 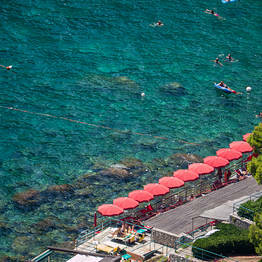 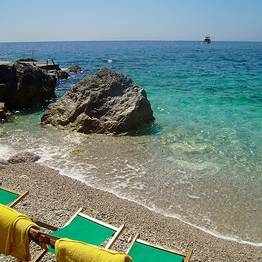 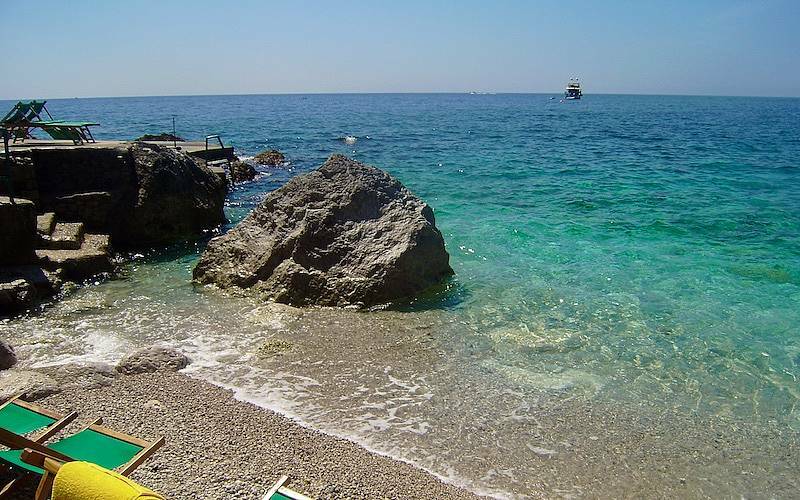 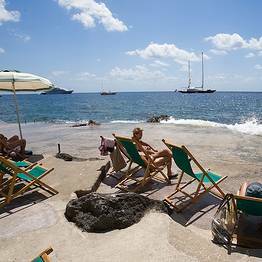 From Capri's Piazzetta, the bathing establishment is only a short taxi or bus ride away. 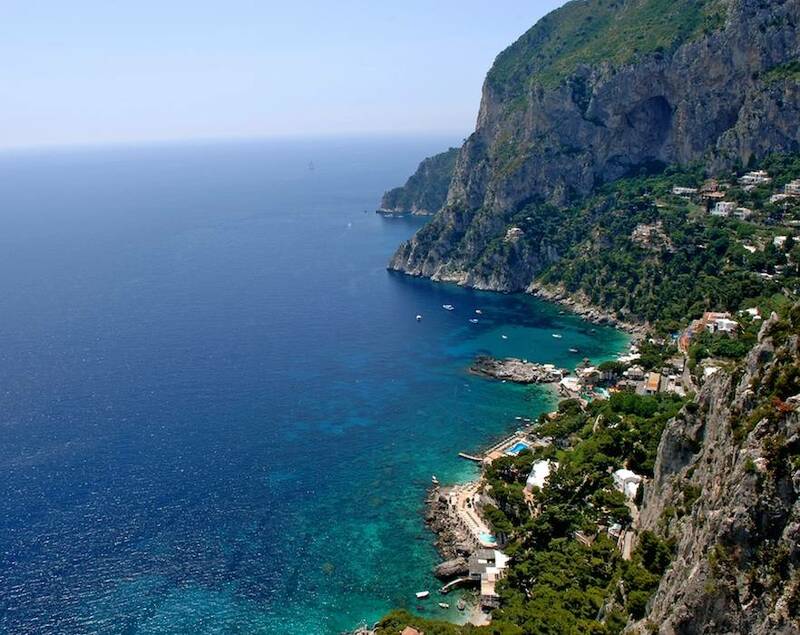 La Canzone del Mare can be reached on foot, by way of the spectacular Via Krupp or, the picturesque Via Mulo.